You can add one of our conchos to your HF1, HF2, HF3 or Leather Paddle holsters. These conchos are 1-1/4" in diameter and have a screw back. Once installed, they cannot be removed or changed. Fortunately, they are very durable. We can install one of your own conchos if you meet certain criteria - No more than 1-1/4" in diameter and with a screw back. 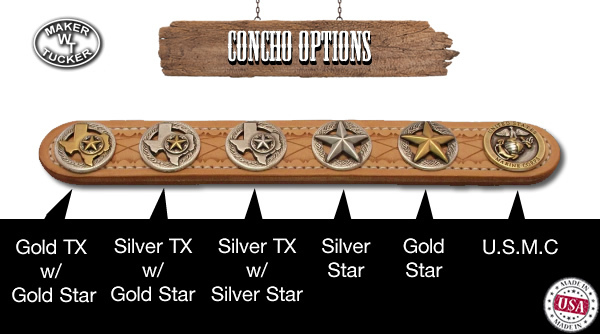 You can find "conchos" on line or talk to us about it. Conchos add a little individuality to your leather holster, but they're not for everyone.